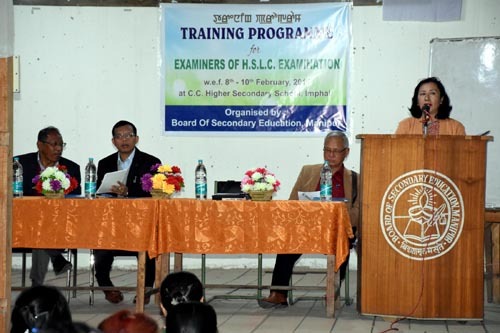 In an effort to conduct the forthcoming High School Leaving Certificate (HSLC) examination in a fair manner, a three day training programme for examiners was organized at Churachand Higher Secondary School in Imphal. The training will be held in three phase in accordance with the subjects with key objective to increase the quality of checking answer sheets and it will be participated by 1500 Examiners including examiners from private schools. It may be mentioned that the annual HSLC examination will be held under the aegis of the Board of Secondary Education, Manipur (BOSEM) from February 20 to March 15. Attending the opening function of the training programme, Secretary Dr Chithung Mary Thomas of BOSEM said 139 examination centres have been identified and admit cards will be issued shortly to 38,000 aspiring candidates as done in the preceding years. Dr Thomas also clarified that private schools are being utilized as examination centres and principals and teachers will be utilized as examiners and invigilators as their cooperation is needed for smooth conduct of the HSLC examination. She said there is a need to improve every aspects of HSLC examination for the overall improvement of the image of BOSEM. The role of examiners is paramount as their evaluation process will decide the rank of all the aspiring candidates. She also urged the evaluation trainees to be fair, objective, unbiased, consistent alert and careful while giving marks and also try to make intentional mistakes. On the other hand, Director Th Kirankumar of education (Schools) department said BOSEM is aiming towards improving the quality of the checking, testing, tabulation including improvement of the quality of the results which will be declared. Stating that the lists of examiners are quite old and it needs to be updated and expanded, Director said that there is provision to include private schools teachers after due process of checking necessary qualifications and work experience. Stressing that to tap the potential of the students they will be given an opportunity to give their own answers provided it touches the concerned keys, he also urged the examiners to be fair and thorough while giving marks and checking answer sheets informing that pens and identity cards will be provided to the examiners and no other pens issued by BOSEM will be allowed. CCTVs will be installed in the exam halls to monitor the numbers of sheets collected and to ensure that the examiners are regularly attending during the evaluation period.